Dr. Alan K. Miller received his medical degree from the University of Pittsburgh School of Medicine in 1989. He completed his General Surgery internship at the National Naval Medical Center in Bethesda Maryland. He then served for one year as a Battalion Surgeon for the 3rd Light Armored Infantry Battalion and as Regimental Surgeon for the 3rd Marine Division in Okinawa, Japan before going on to complete his Urology training at the Naval Hospital San Diego in collaboration with the University of California at San Diego. He is Board Certified and a Fellow of the American College of Surgeons. Dr. Miller came to Bradenton after serving 15 years in the US Navy. He was honorably discharged as a Commander and served with the US Marines during the first Gulf War. He met his wife while in the Navy and they traveled the world together before she retired as a Navy Nurse in 2007, after 20 years of military service. Dr. Miller is currently the Chief of Staff at Manatee Memorial Hospital and was Chief of Surgery at both Lakewood Ranch Medical Center and Manatee Memorial Hospital. He currently serves on the Board of Governors for Manatee Memorial Hospital, the Florida Urological Society and the Manatee County Medical Society. Dr Miller is actively involved with teaching. He is a Clinical Instructor for Lake Erie College of Medicine and participates in teaching Urology to the Internal Medicine and Family Practice residents at both Blake Medical Center and Manatee Memorial Hospital. Dr. Miller is passionate about clinical research. He is the founder, CEO and Principal Investigator for Manatee Medical Research Institute, a highly regarded clinical research company headquartered in Bradenton. He is currently researching advanced prostate cancer, advanced bladder cancer and all areas of voiding dysfunction. 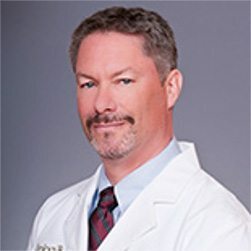 Dr. Miller is an accomplished cryosurgeon and takes special interest in learning minimally invasive techniques to treat urologic disease. He was the first in Bradenton to perform Renal and Prostate Cryosurgery as well as Botox injections for the treatment of urinary incontinence. He also has extensive experience performing vasectomies and vasectomy reversals. Dr Miller has been recognized as a Best Doctor in Urology since 2012. In his free time, Dr. Miller enjoys motorcycles, boating, photography and traveling.